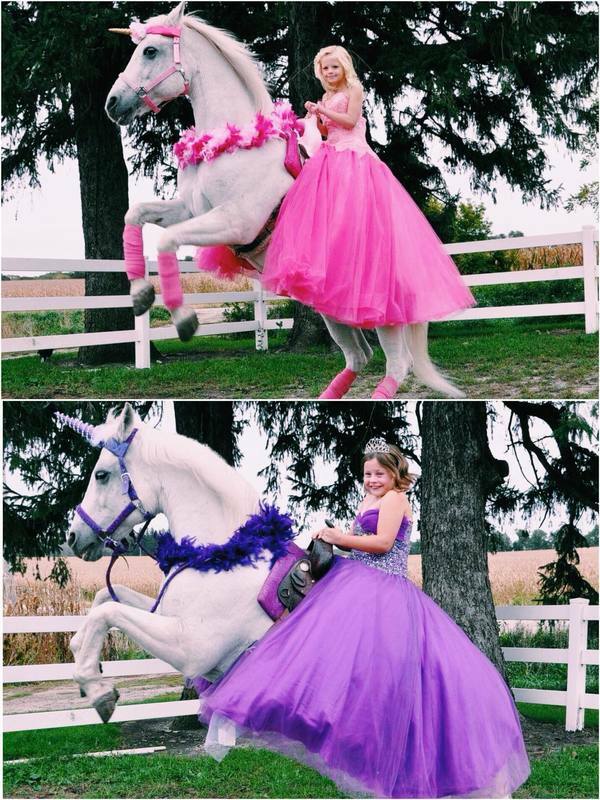 Royalty & Me is so excited to now offer live UNICORNS as an add-on item to any package or event booking. Unicorns may not be booked independently without the purchase of a Royal Package. Add a Second Unicorn for $125. This price includes one pink, purple, or white-horned unicorn + one experienced unicorn handler for an hour of unicorn rides for all guests (CHILDREN ONLY). Get one Unicorn of your choosing for 1 hr + one Princess of your choosing for 45 Minutes. The princess will arrive first for a Royal Crowning Ceremony, singing "Happy Birthday", and photos/autographs (15 Minutes). Guests and Princess will then move outdoors for 30 minutes of rides with the princess present, and an additional 30 minutes of rides after the princess departs. What space is required to rent a unicorn? You must have space large enough for the unicorn to walk and perform tricks. (Suggested space 40x40 feet. Grass or hard surface permitted.) In addition, there must be a space to park the unicorn trailer and vehicle. Can unicorns be rented in the winter months? Yes. If booked in the winter, children must be prepared to be out in cold weather for their unicorn rides. Deposit is not refunded for weather cancellations, but reschedules are permitted in cases of severe weather. You must be certain that your venue allows livestock or horses on the premise before booking your unicorn. Your deposit will not be refunded if you must cancel your event for this reason. Please notify us of any cleanup that must be done at your location. Royalty & Me is NOT liable ​for any incidents that occur during the use of this service, as it is provided by an outside party. The unicorn handler may require riders to sign a release form before allowing children to ride the unicorn. You will be notified of this ahead of time. Add a customizable t-shirt to match your party's theme and character choice. Your birthday girl's name and age will be printed on the back of the shirt to make for an adorable keepsake! You tell us your party theme and character, and we will create an adorable custom pair of "Mouse Ears" for your birthday girl to rock on her special day! These are also a perfect add-on for our Vacation Announcement package. Taking a dive under the sea for your party? We will create your birthday girl and guests customizable seashell bra tops in any color, adorned with rhinestones and pearls! Just like The Little Mermaid's! No time to put together the perfect party favor? Let us do all the work! Starting at just $5/guest, we will create custom goodie bags with princess prizes that your party-goers will adore. ROYALTY & ME IS NOT AFFILIATED WITH THE DISNEY BRAND IN ANY WAY. ALL CHARACTERS ARE UNIQUE INTERPRETATIONS OF ROYALTY & ME.